William Cummings, the real estate entrepreneur whose foundation’s financial support in 2004 established a new chapter—and name—for New England’s only veterinary school, will bring greetings from the Tufts University’s Board of Trustees to the 88 graduates Sunday at the school’s 29th annual commencement exercises. Three of the graduates will receive PhDs in comparative biomedical sciences, eight will receive master’s degrees in Animals and Public Policy, and 77 will receive Doctor of Veterinary Medicine degrees—including student speaker Carolyn Gross. Two DVM candidates will also receive master’s degrees in public health, while another six will receive Master of Science in Laboratory Animal Medicine—the school’s largest graduating group in the combined program. Also speaking will be Assistant Professor of Clinical Sciences Dominik Faissler, DVM, a board-certified specialist in neurology. Assistant Professor Armelle de LaForcade, DVM and Professor Dominique Penninck, DVM, DVSc, will receive Pfizer Animal Health awards for distinguished teaching and research excellence, respectively. The commencement exercises will also feature the Artemis Award, a new faculty prize, established by Trustee Emeritus Alfred Tauber, MD which recognizes clinical excellence. The award will be given this year to staff veterinarian Michael Stone, DVM. In addition, Associate Professor Richard Jakowski, whose three decades at the Cummings School helped to establish the school’s pathology curriculum and service, will receive an emeritus designation. In addition to leading the school’s section of pathology, Jakowski was a dedicated teacher and contributed to collaborative research. He has continued some clinical and teaching work even after his 2010 retirement. 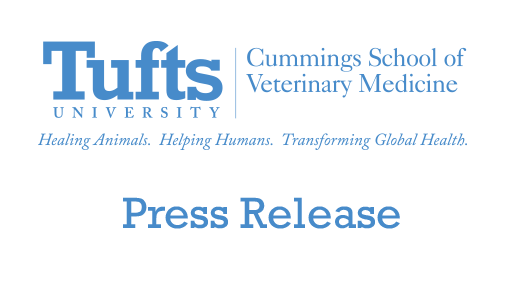 Martha Smith-Blackmore, DVM, a 1997 Cummings School graduate and director of the Animal Rescue League of Boston’s veterinary medical services, will receive the school’s Henry E. Childers Award, given to part-time instructors who have made extraordinary contributions to educating veterinary students. Smith-Blackmore is also the president of the Association of Shelter Veterinarians. 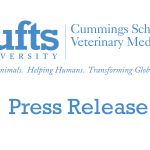 Administering the Veterinarian’s Oath will be Clinical Associate Professor Mary Labato, DVM, a member of the school’s first-ever graduating class and immediate past president of the Massachusetts Veterinary Medical Association. Cummings’ greetings to the graduates marks the first time the trustee emeritus has participated in commencement on behalf of Tufts University’s board of trustees. He and his wife, Joyce, recently made headlines after becoming the first Massachusetts couple to join the Giving Pledge, promising to donate at least 90% of their wealth to charity. More information about the commencement ceremony can be found on the Commencement site.